portable stations specializing in microwave (usually bands between 1296-10368MHz) usually operating distant mountain tops. Distances are calculated using the Maidenhead grid locator system and contest contacts consist of exchanging signal strength, a contact sequence number and which grid square you are operating from. 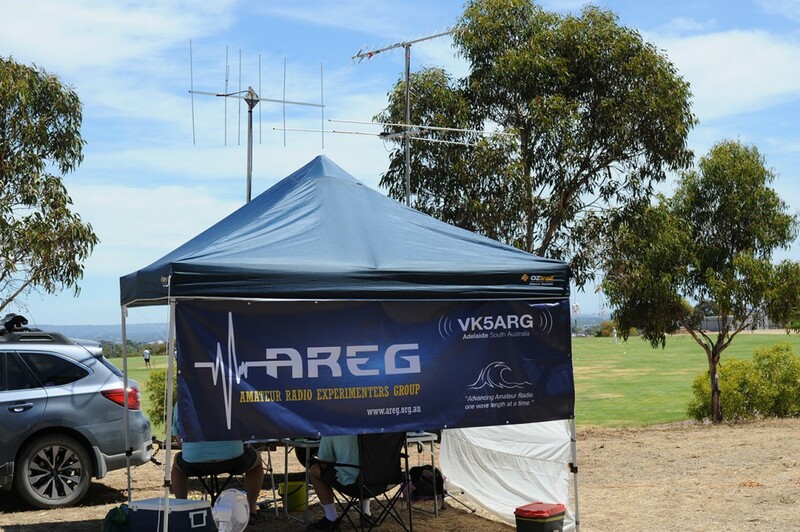 This year, the AREG decided to mount a portable station using the Club call-sign, VK5ARG, which operated in the 8 hour division. Bob, VK5FO and Ray, VK5RR arrived onsite just after 10am and after meeting Paul from the Salvation Army commenced the set-up of the station. Andy VK5AKH arrived and assisted with the station set-up. The station was very similar to the Team VK5FI station that Bob and Ray set up for the Spring Field Day, with the addition of 23cm. A few small changes were made to the station from the lessons learnt during the Spring FD – and that was ensuring that each band had a dedicated logging laptop and adding some headphones! The addition of the club marquee was most welcome with temperatures in the mid 30’s – we were able to operate in relative comfort! The station was set-up and ready to go a few minutes to go before the start time of the contest. During the course of the day we had a few visitors drop in to take a look at the station, and Ben VK5BB, popped in for an hour or so and operated the 6m station for part of his time. Everyone present had a great time, and the highlight of the day was Bob VK5FO making a few DX contacts on 6m – working 3x ZL stations an a VK4 station. At the end of the 8 hours, the station was pulled down and packed up in about 45 minutes. We would like to extend a special thank you to the Salvation Army Wynn Vale for allowing AREG access to their land behind the Hall. 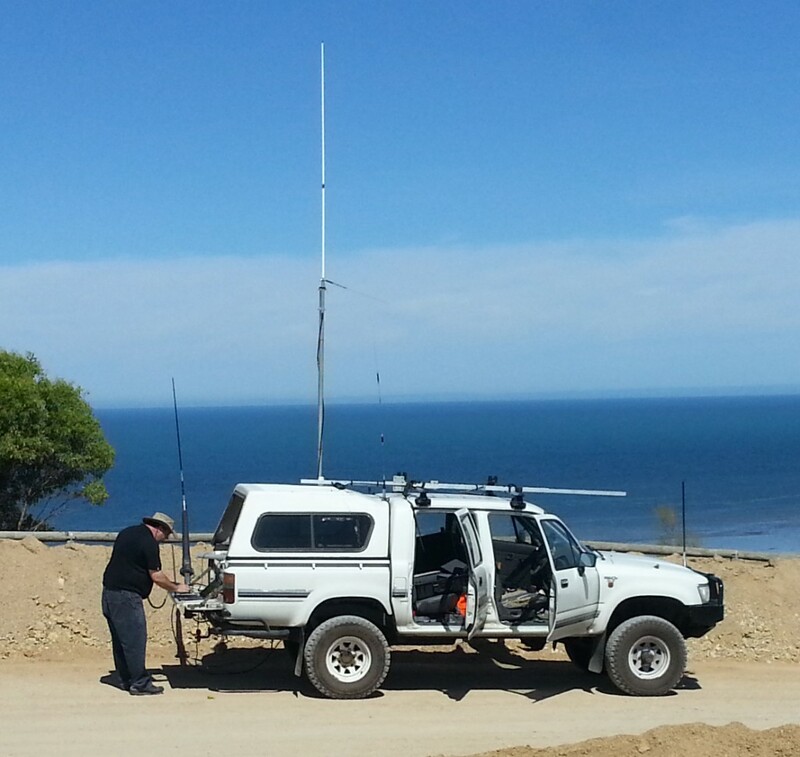 The site proved to be quite good for this type of station with excellent take-off in all directions for VHF and UHF. Photo Gallery from the Day! AREG Members Roving during the Contest too! 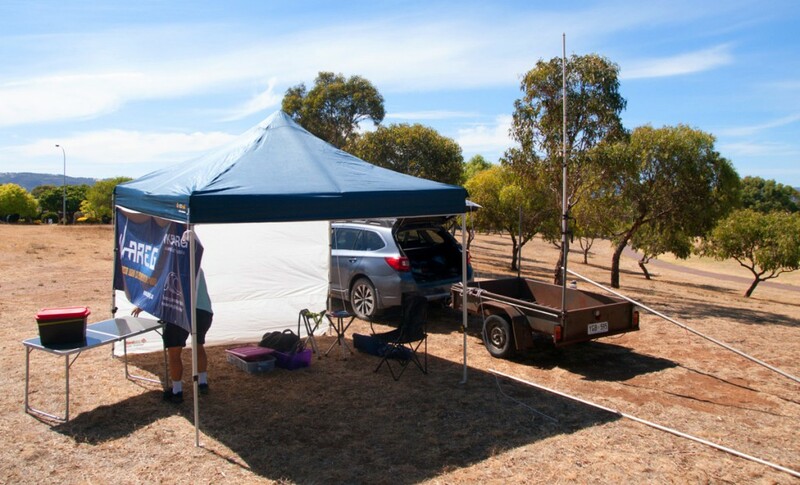 While the club members were having fun manning the station in Adelaide, Matt VK5ZM and Grant VK5GR took a different slant on the contest and entered the Roving section operating as VK5GR. They started out the day by driving to Port Giles on Yorke Peninsula. This was significant as it allowed them to activate major grid square PF84. 6m was the surprise here working VK7DD on 52.525 FM. Good contacts were also had with many Adelaide stations on 144 and 432MHz. After about an hour they packed up and hit the road, contesting along the way. 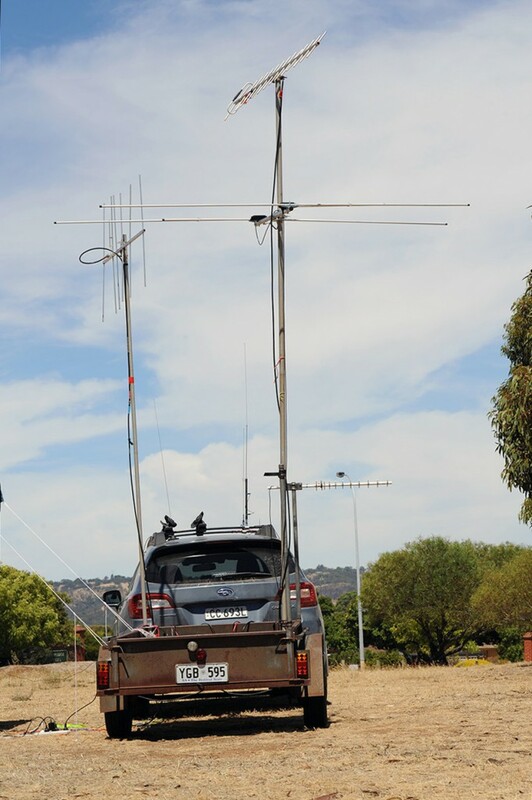 At each new 6 letter grid they came to they stopped for 5-10 minutes and made a set of contacts on both 2m and 70cm using just the mobile antennas on the car. The tropospheric ducting was strong across the gulf as all of the signals were S9++ – not bad for an average 70-100km path! After Port Vincent it was decided that things needed to be sped up a little or the objective of at least 4 major grid squares in 8 hours wasnt going to be met. So they started contesting while mobile on the highway (at 100kph). This proved challenging as they now were working a new grid square about every 3-4 minutes! Usually there was time for 2-3 contacts per square on one or two bands before they had to stop, update their locator in the logging software and go again. They kept this routine up for about 8 squares before reaching the slag heap lookout at Ardrossan. 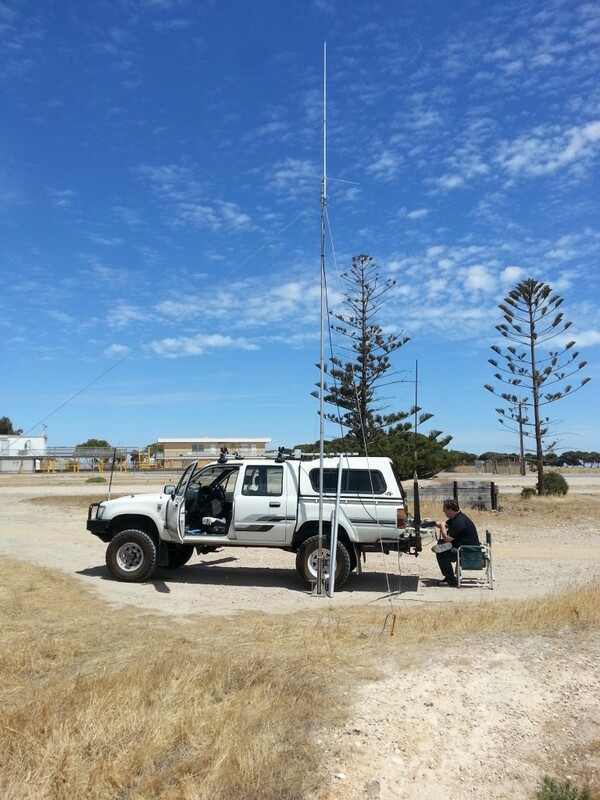 At Ardrossan they came across Tim VK5ZT who was participating in the microwave section of the contest. It was great to see the microwave guys in full swing! Matt and Grant then also broke out the 6m antenna and gave some calls on both 50.2 SSB and 52.525 FM so that they could claim 6m for grid square PF85. 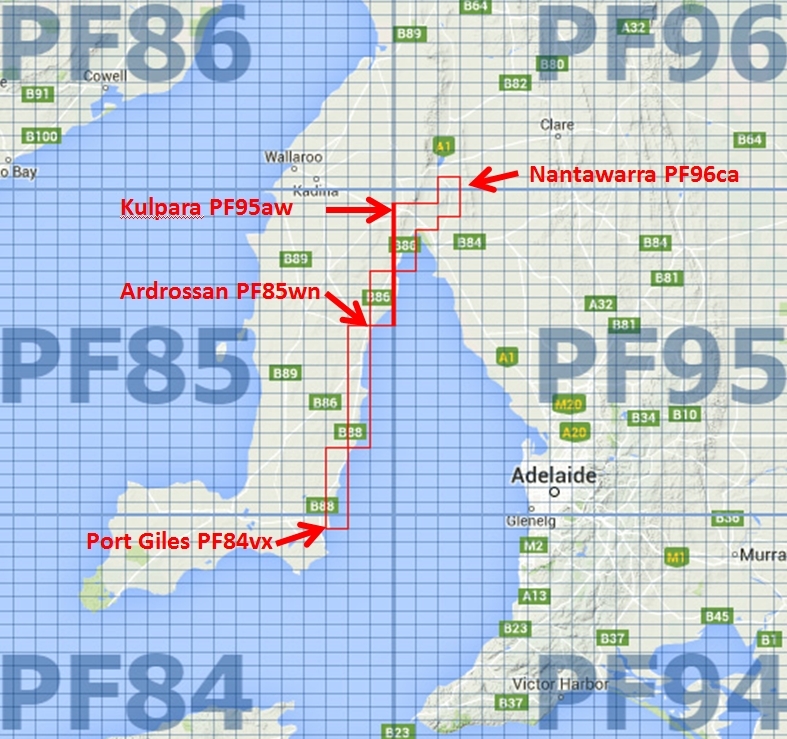 As time was then running short, they then decided to drop an attempt to work from PF86 (which was going to be a very difficult path to Adelaide) and instead focus on distance contacts from the northern edge of PF95 and southern edge of PF96. To do this they headed for Kulpara, where they also found Iain VK5ZD operating also in the microwave section. Some more 2m and 70cm contacts were had just from the mobile whips on the car (but with the advantage of ~200m elevation on top of the Hummocks range) before then packing up and heading for their last site of the day on Middle Range Hill near Nantawarra. This allowed them to activate grid square PF96ca. Here they broke out the big guns and put up the 2m beam. A couple of contacts were made on SSB including to Port Pirie and the Riverland, plus multiple contacts back down into Adelaide. 6m and 70cm were also activated, with every contact on average exceeding 120-140km. Finally they dropped back into PF95cx for a 20 minute closing flurry before the 8 hours was up. Everyone in the club who participated had a great day, be it on the road, operating from home or portable in Wynn Vale. It has certainly stirred up some enthusiasm so look out for VK5ARG operating in the Winter Field day in 2016! To hear more about the activities over the weekend come along to the club on Friday the 15th of January! This entry was posted in Club Activities, Contesting, VHF UHF DX, VK5ARG On The Air by VK5FO. Bookmark the permalink.